Like the textile panels, beads bring out the beauty and magnificence of the orishas. In ancient Yorubaland, beads were considered a status symbol: a marker of power, hierarchy, and economic well-being. Many beads are highly valued for their specific relation with an orisha. Ivory and mother-of-pearl beads are status markers for Oduduwa and Obatala, the two most respected orishas in the pantheon because of their proximity to Olodumare, the Supreme Being. Coral, although attributed specifically to Oshun and Yemoja, is considered a symbol of prosperity, believed to bring luck and fortune to the wearer. Azabache (jet) beads are believed to guard the wearer from envy and the evil eye, a belief found among many cultures, including the Spanish culture encountered by the Lukumi in Cuba. Erinle, considered a refined orisha par excellence because of the often exquisite nature of many of his attributes, wears a necklace of coral, jet, and gold beads. Ibu Ikole, a road of Oshun, uses a necklace made of jet, coral, and amber. Collar de mazo, usually abbreviated to mazo, literally means a necklace of clusters or bunches. The term is probably derived from the way glass beads are usually sold, strung in mazos, or bunches of about a kilogram or less. In Spanish, the term mazo refers to portions of items that are somehow strung, clustered, or bunched together. 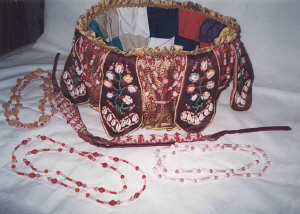 A mazo consists of various strings of beads, divided into sections called casetas or casas (huts or houses) that are separated by larger beads called glorias. Once tied, a number of tassel-like strands hang from the front and sides of the necklace. Each of the strands’ strings are finished at the end with a smaller gloria and tied in a very discrete way so that the string and the knot are barely visible. 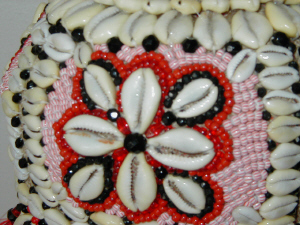 Cowries can also serve to finish each string, especially for orishas such as Shango and the warriors. The color, number, and pattern of the of beads, as well as the number of the strings, are determined by the ritual number related with the orisha for whom the mazo is intended. Traditionally, mazos are made with cotton or other naturally produced string that will absorb the omiero (a ritual herbal infusion) that will later be used to consecrate it. Recently, fishing line has grown in popularity because of its durability and sturdiness, making it easier for the artisan to bead without the use of beading wires or needles. The strings for the mazo are measured and cut to usually about a yard or more in length. 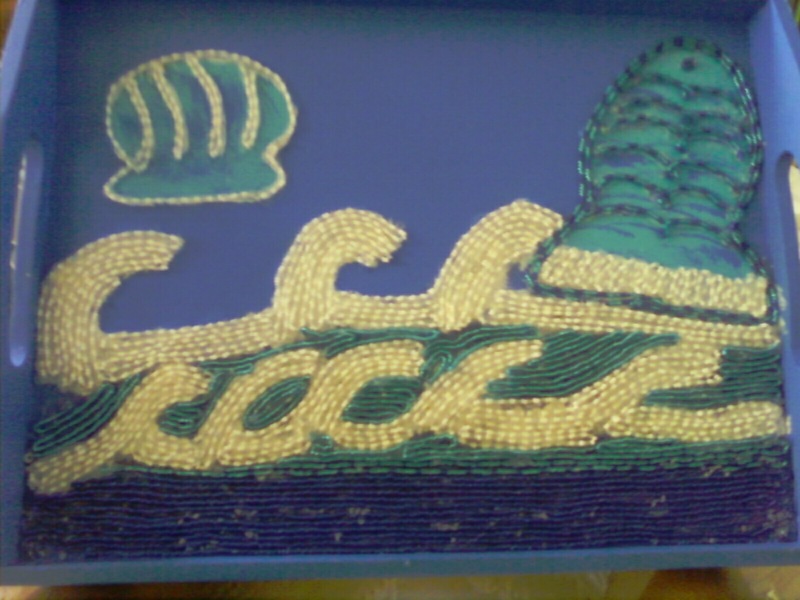 A section of each string is individually beaded in a specific pattern of a determined length, usually averaging between three and seven or so inches. These patterns are determined by ritual as well as creative elements. Once all the strings have been beaded, they are conjunctly passed through a gloria that separates the sections into casetas or casas. A mazo typically has at least ten or more casetas. Once all these sections have been strung, the ends are brought together, crossed through glorias, and tied and sustained on each end of the glorias. From the strings that cling from this knot, the artisan will make the central or principal tassel that will hang in the front part of the mazo. Once tied, the strings that cling from this junction of the necklace are double the number of strings that make up the body of the necklace. For this reason, this front tassel is considered the principal one. It is purposely ornamented more than the others. The tassels on the sides of the mazo will have the same number of strings as the necklace itself. For these, the artisan cuts separate strings and ties them between the casetas on the side of the mazo. The number of tassels is also determined by the ritual number of the orisha for whom the mazo is intended. An ide or oshaide is a beaded bracelet worn on the left wrist that is meant to identify the olorishas tutelary deity. The iyawo is required to wear the ide for the entire year of his or her novitiate. 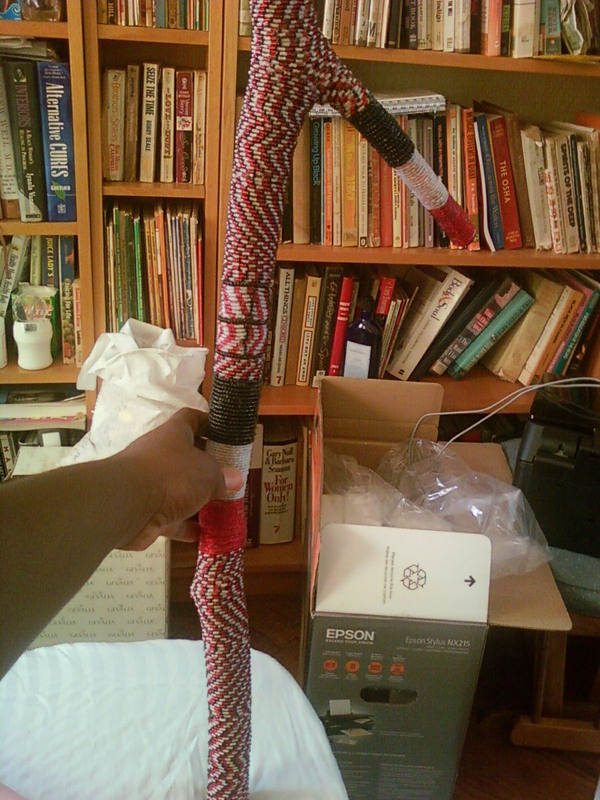 Afterward, it can be worn for ritual functions and kept with other orisha paraphernalia when not in ritual use. Like the mazo, the ide consists of various sections of multiple strings of beads. These sections are also called casetas and are similarly partitioned by glorias. Because it is intended to be worn on the wrist, the ide is terminated with a brooch or lock of some sort. 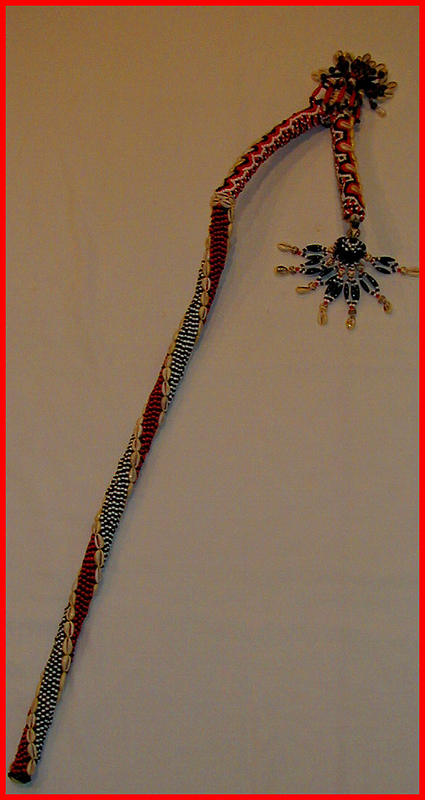 Elekes are the single-string necklaces worn by olorishas. 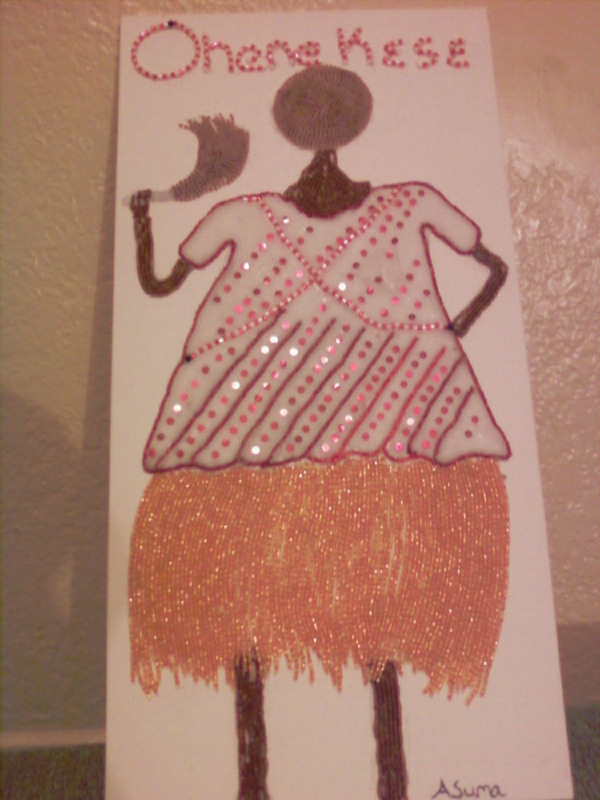 They are strung in the preferred patterns and colors of the orisha whom they represent. Often, elekes will be ornamented with cowries, glorias, and semiprecious as well as precious beads. Coral, mother-of-pearl, ivory, and jet beads are most popularly used. Mayas (literally, nets), are used to ornament the jars or tureens that contain the orishas attributes and paraphernalia. Often these replace the mazos. They are nets of beads and glorias in elaborate patterns. Because choice and size of jar or tureen varies tremendously from olorisha to olorisha, mayas have to be tailor-made. Much of the orishas paraphernalia is often entirely covered with beads. 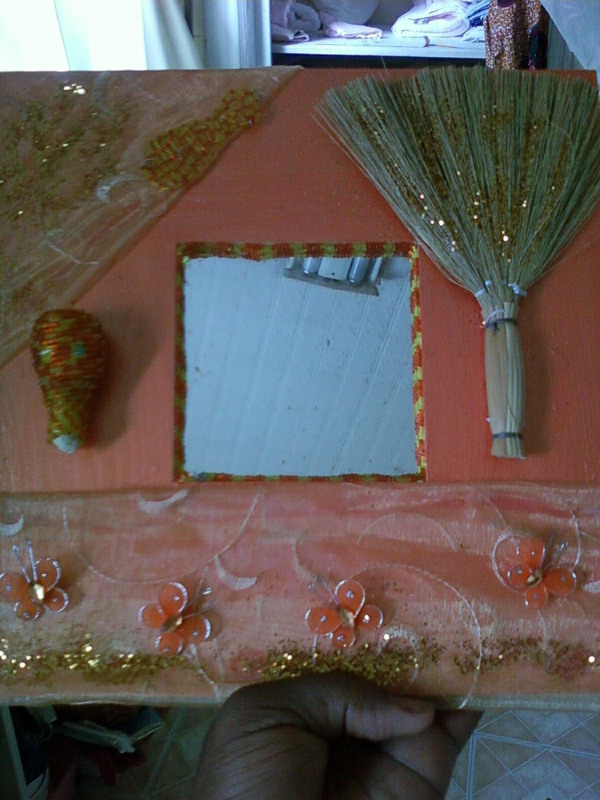 Most often, this is done to embellish the orisha and the item and is not necessarily in conformance to ritual dictates. Beads are strung in the patterns particular to the orisha for whom the item is intended and then wrapped and sewn into place. 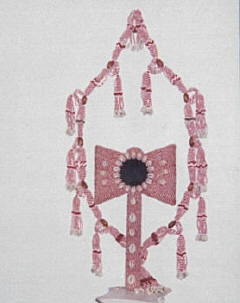 Depending on the item, a tassel may be placed at one of the ends. Often irukes (made with the hairs from a horse or ox tail), adas (machetes or scimitars), asheres (maracas), oshs (Shango axes), and many other items that are beaded have tassels hanging from the ends. The ja is part of Babaluaiyes paraphernalia, though other orishas such as Nana Buruku and Oshumare also use a ja. With it, the orisha cleanses and protects devotees from sickness and negative energies. In possession, he dances with the ja as if it were his scepter. Kasha is a generic term that describes a type of bracelet that employs beads and cowry shells in its manufacture. They are usually worn on the left hand, but depending on the orisha, kashas can be fashioned for the forehead, waist, ankles, and upper arm. Various orishas use kashas. Babaluaiyes is made with goat hide and burlap over which seven cowries are sewn and ornamented with beads. 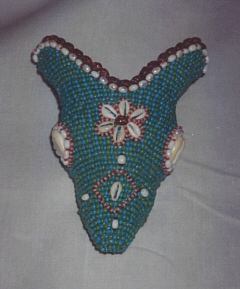 Oshosis kashas are made from deer skin and burlap and cowries. 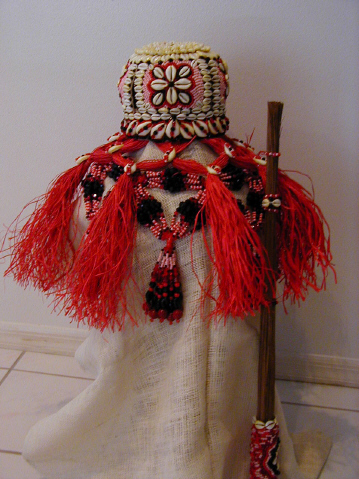 Yewas kashas are made of either raffia or henequen (Agave fourcroydes, Lemaire-a natural fiber used to make rope), braided, and sewn over red or crimson textile. On these, the artist sews the cowries and beads.